In case you were wondering- these are freaking delicious. Like I completely blew up my pre-Greece diet when I made these. DESTROYED it. Couldn’t stop eating them. 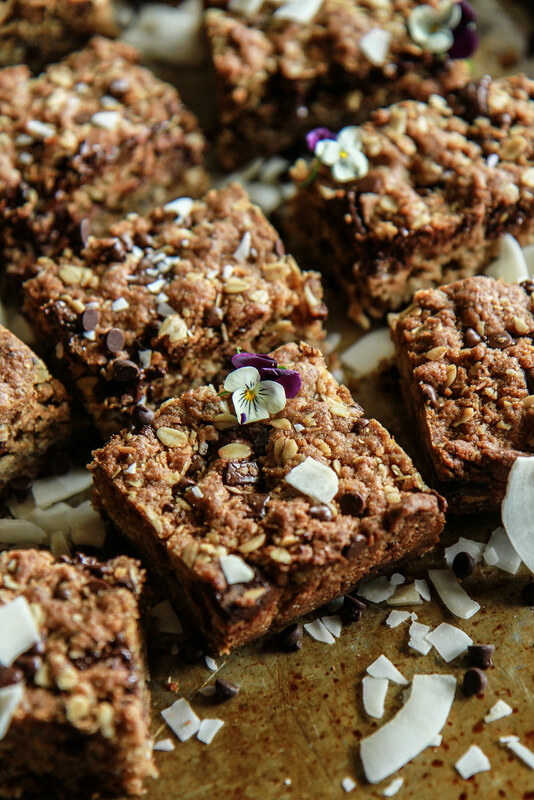 They were the perfect blend of crispy and chewy- fully packed with oats, coconut, chia seeds and sunbutter, with just the right amount of chocolate! The best part was how much my kids liked them too- because that meant we went through them three times as fast and I couldn’t keep sneaking them!! Just kidding- kind of. Because this recipe made quite a few bars, I cut them all up and then put a few in the pantry in an airtight container and the rest I put in individual wax bags and froze. So when the kids are packing lunches for camp or park picnics this summer, they are really easy to toss in- and by the time they are ready to eat, they have thawed! I might need to add that I know from personal experience that they are also well suited to morning coffee, late afternoon tea, dessert and just general snacking. Or all of the above. ⅔ cup vegan butter at room temperature. Preheat the oven to 350 degrees and spray a 9x13 baking dish with coconut oil spray. In a small bowl, combine the chia seeds and hot water, stir well and set aside until it turns into chia “goop” about 5 minutes. In the bowl of a standing mixer, beat together the sugar, vegan butter, sunbutter and vanilla until well combined and fluffy. In a separate bowl, combine the dry ingredients and then add them to the standing mixer along with the chia goop. Beat together until you have a well-combined, thick cookie dough and then briefly mix in the chocolate chips. Transfer the dough to the prepared baking dish and press it firmly down into the pan. Bake the cookie bars for 45 minutes or until the top is golden. 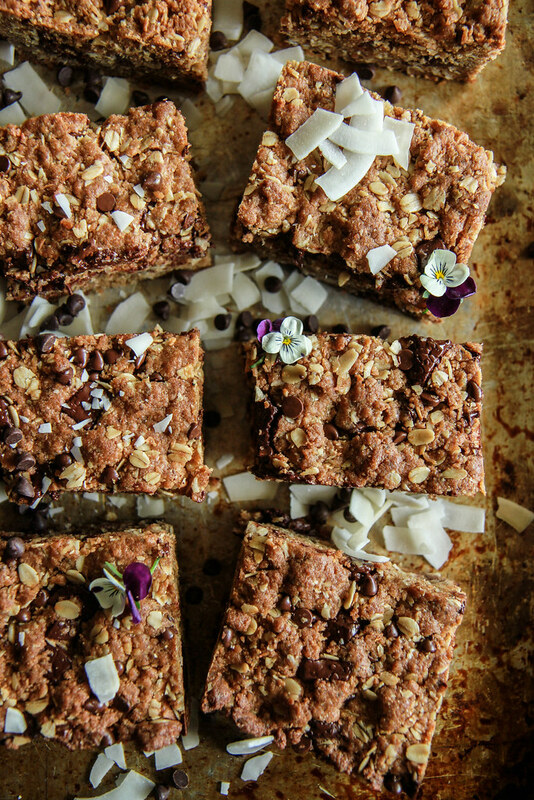 Let the cookies cool and then slice them into bars. Yum! These are calling my name! These would not last long in my home! Wow. Delicious! 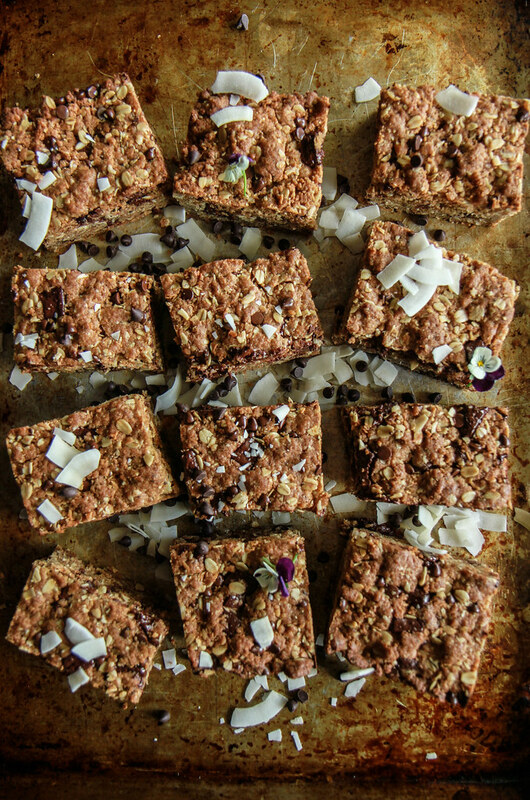 Cookie bars are my kids favorite! Love the sound of these bars!